"Fit for Study is flexible so that you can fit it around study, work and other commitments. The training and professional development opportunities have also been really useful". "It is so rewarding to know that just a small amount of my time has had a positive impact on others around me". "The Fit for Study program is very easy-going and an enjoyable way to contribute to the UWA communities. The activities are interesting and you also get to learn a lot whilst implementing them". 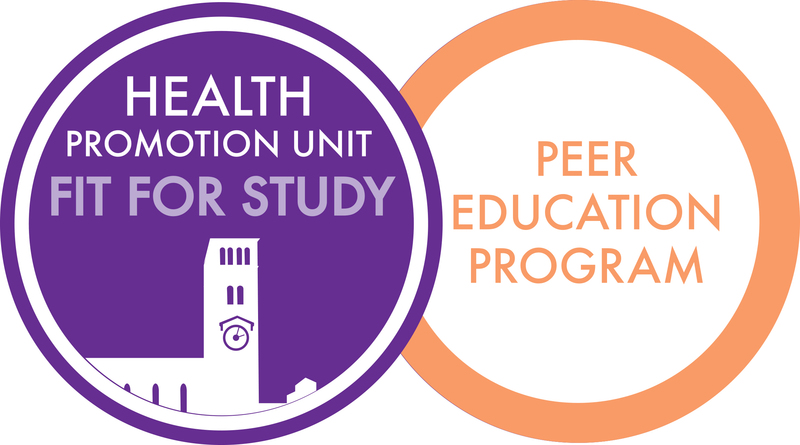 Peer Educators are vital members of the Health Promotion Unit (HPU) team. We recognise and value the reciprocal nature of the relationship between our organisation and individual volunteers. At the HPU, we are committed to providing a volunteer program which supports our work while meeting the expectations and needs of our individual volunteers. Our Peer Educators deliver health education in a student-friendly way and keep our programs relevant to the student body. Why should I volunteer with the Health Promotion Unit? Whether you want to put your University skills into practice, or just want to try your hand at something new, by volunteering at the HPU you will gain first hand experience working on health promotion projects and programs. How much time do I have to contribute? How often you wish to volunteer is up to you. You can commit to volunteering on an ongoing basis or participate in one-off activities and events on and around campus throughout the year. Yes! Our volunteers are provided with training and support to ensure they have the knowledge and skills to contribute to Fit for Study projects. As a Fit for Study Peer Educator, you can work on any of our projects, depending on your interests and how much time you have to contribute. Take your first step and register online as a Fit For Study volunteer. One of our friendly staff will then meet with you to discuss volunteering opportunities based on your interests and availability.